1. Who painted the Lienzo? Market in central Mexico. 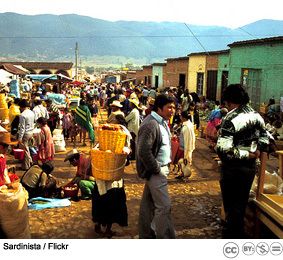 Today, approximately 1.5 million people speak Nahuatl. 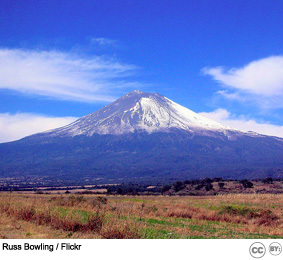 Popocatepetl, which means "smoking mountain" in Nahuatl, dominates the central Mexican landscape. Who painted the Lienzo de Quauhquechollan? The Lienzo de Quauhquechollan was painted by a group of Mesoamerican Indians from the region of Quauhquechollan. 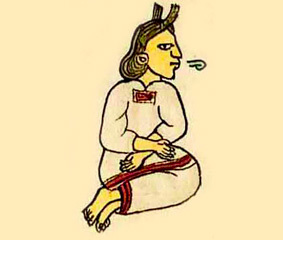 The Quauhquecholteca spoke Nahuatl, the language of the Mexica (Aztecs). The highly skilled artists who painted lienzos were called tlacuiloque in Nahuatl. 4. What makes this lienzo so special? 5. Is it really a map? 6. Why ally with the Spanish? 7. Why ally with the Quauhquecholteca? 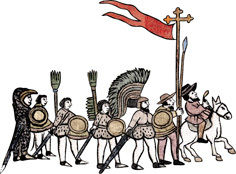 8. Who were the Mexica? 9. Why paint the Lienzo? 10. How was it deciphered? 11. How does the story begin?